Castleford Tigers boss Daryl Powell was disappointed for his players that their efforts came to nothing in defeat against Huddersfield Giants in their latest First Utility Super League game. 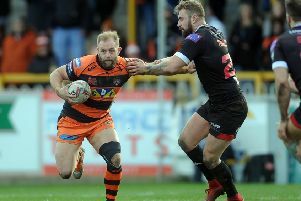 Powell was pleased with the way the players stuck to their task in the face of adversity and some controversial decisions going against them, but ultimately it was a third straight defeat as the Tigers walked off the pitch 24-16 losers. He said: “The boys worked really hard and we hung in and gave ourselves a chance, but there were some disappointing things. “I honestly thought we were playing American Football in the first half. There were that many passes going forward and none of them getting picked, I thought it was ridiculous. “I just said hang in, there’s a lot of things going against us. We conceded a couple of sloppy tries we could probably tidy up, but I thought we’d defended pretty well on the main, especially on our try-line. “They got us with a couple of charges that we didn’t deal with well and a kick to the corner.